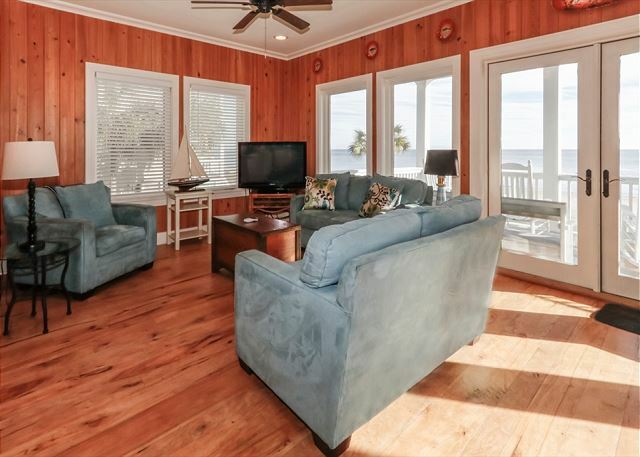 Real Escapes Properties is proud to this one of a kind, special place located right on the beach. Unique, relaxing, luxurious living space with wonderful views from all three floors. Close to pier village and parks. Top floor suite has bedroom with king, full bath and living area with kitchenette. 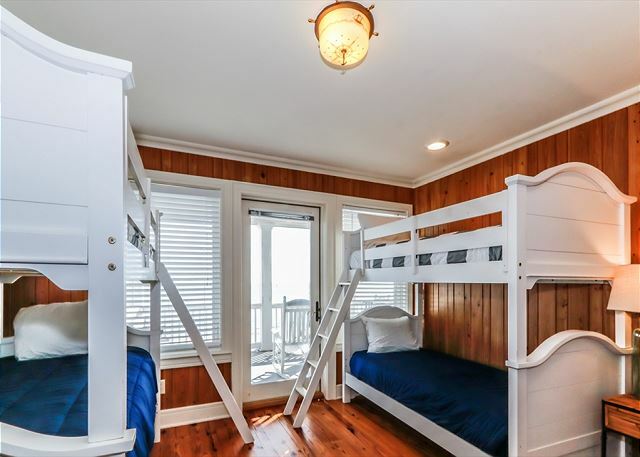 Second floor has two bedrooms with two bunks and one queen respectively and a full bath each. 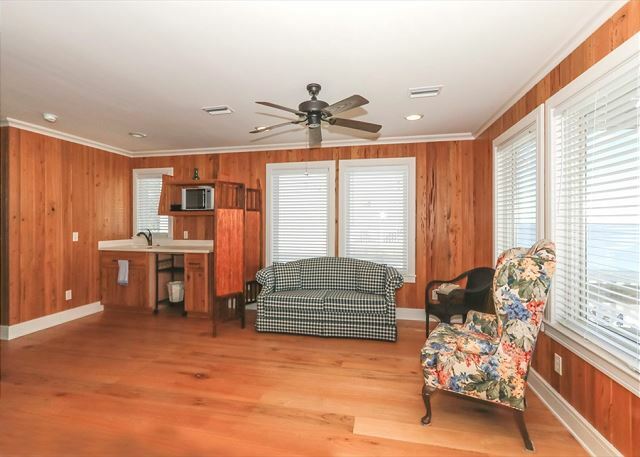 Main floor has living room, twin sleeper, dining area and well equipped kitchen, and a half bath. There are full length porches facing the ocean for each floor. Ground level has garage and picnic area facing the beach and ocean. Elevator serves all floors. Flat screen TVs in bedrooms and main living space. DVD. Wireless internet access. Washer/dryer. Occupancy limited to 8. Dogs under 50# allowed with pet fee. Loved the house, very roomy! Everything was cleanec when we got there. Would to come and stay there again! Our family had a wonderful time. Loved sitting on porch ! We had a wonderful time! Home away from home with a much better view! This is our second year at Shasta's II. We love this homey, comfortable house. From the first time we saw it, it was love at first sight. Watching the dolphins, pelicans, and huge car carriers go by the house in the ocean was a special treat. You can't beat Shasta's location. It's 3 blocks from the downtown area but much closer if the tide is out and you take a short walk down the beach to town. The restaurants are not fancy but neither are the prices. They serve amazing seafood and fabulous BBQ. If you like a t-shirt as a reminder of your awesome time on St. Simons you're in luck. You have lots of shops to choose from. As for the water, the gentle slope of the sea floor make it perfect for kids to splash in the surf. We brought a inflatable kayak and headed for the horizon each morning. Shasta's covered porches got a lot of use. If you wanted "me" time you just had to head for one that was unoccupied. When we go back next year, it will be like coming home again. We think of Shasta's as our special home away from home. It's as comfy as can be with plenty of room for everyone. We love this place. We enjoyed our stay in the home. It was in a great location with very quiet. The master suite is very poorly designed, the single vanity in the bath is disappointing. A couple of chests would be nice to put clothes in and also rise up the TV which is too low to view from the bed. The shower was nice and had good water pressure. The windows beside the dinning room table have large cracks around them allowing air and bugs in. The outside of the home needs a lot of maintenance and railings need to be replaced and painted. The ground floor porch was horrible,knee high weeds growing out of the cracks - no excuse for that. I was pleasantly surprised at how well the kitchen was stocked with plates, silverware, cups - very nice. On the 2nd floor (kitchen and living room) the floor was very dirty when we arrived, I dropped some water and wiped it up with a paper towel and was amazed at how dirty it was,would not want kids on that floor, it needs a good scrubbing. There were a lot of nice linens which was great. The kitchen could use more towels. I had to wash them and the washer and dryer worked very well. I would recommend the home but with reservations, this is not really a luxury home, just a luxury location. Location on the beach perfect! Elevator access to all floors was wonderful. Kitchen supplies were excellent (once cleaned). House, however, is in desperate need of maintenance repair - so sad to see such a lovely home falling apart. Also very disappointed on lack of any beach supplise ie chairs or toys or outdoor maintenance. 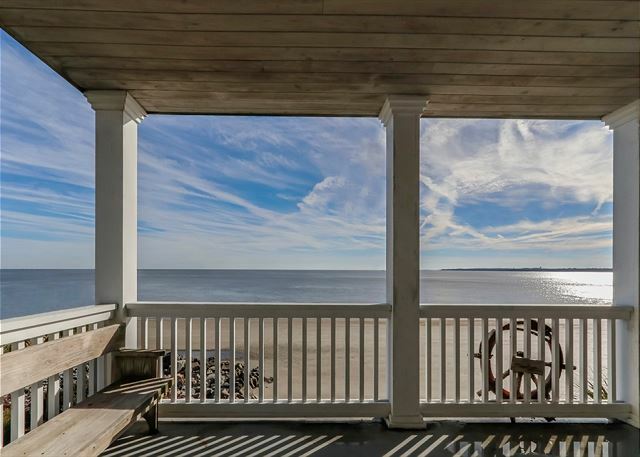 Views from every porch, well equipped kitchen, wonderful mattresses and literally steps to the beach. We are 5 retired educators who enjoy relaxing. This was the best place we have found and we have been going together annually for 35 years! The rental experience was amazing! Although there were some issues with the property - most notably, none of the outside doors could be locked, even though public access can be obtained easily via the staircase on the back porch. 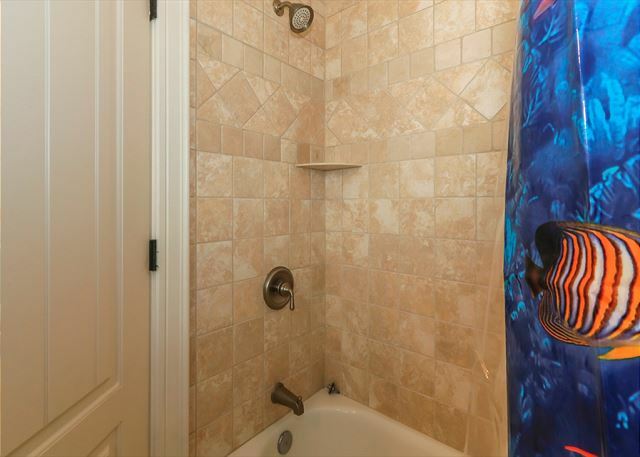 Also, both master bathroom showers had missing/moldy grout around the doors, and leaked through the shower doors. Also the living room furniture arms were black with mold/dirt. The House took care of all our needs. A lot of space and a wonderful view. REP made it very easy for us. The house was beautiful, couldn't have had a better view. You could tell that the owners tried to have everything in the house that one may need during vacation. The house outside was a bit beaten up. That's just part and parcel of being beach front. The rocking chairs would have been wonderful but they were rotten. Two were completely unusable and the rest wouldn't rock properly. Upon arrival, we sat on the couches inside the living area and they were coated in sand. We understand that this is a pet friendly home but housekeeping had been there before we arrived.....wouldn't they have checked those couches? Took us a few days to figure out how to lock the doors leading to the balconies so some up front info on that would've been nice. Again, it was a beautiful home, best view on the whole island and very well appointed. The location was perfect. We walked to breakfast, lunch and dinner! We'd rent it again in a second! Had a great time with family. Love, Love, Love St. Simons Island! We stayed in the historic district. Only 3 blocks from the downtown area, it was an easy walk to some of the greatest food and fun shops I've ever experienced. Tours are available to get you acquainted with the history of this fascinating area. The beaches are firm which allows you to ride bikes close to the waves. 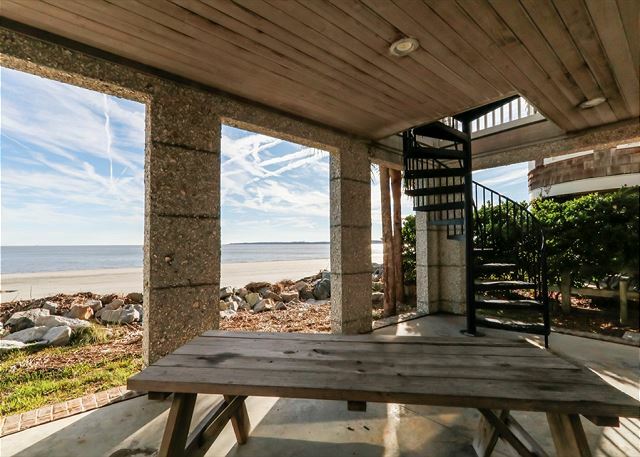 It's a great way to see the homes along the beach from a whole new angle. This is a very civilized island with great shopping, friendly natives, and amazing food. I love the island and all it has to offer. We've already made our reservations for next summer. Great house in an excellent location. Very happy with my experience and plan to return again in the fall. The view of the ocean was wonderful. The house itself is pretty much a dump. There was broken furniture (chairs) on the porches. The garage was very dirty and had old furniture and a hospital bed stored in it. There was no mirror in the bathroom near the bed room with the bunk beds for several days... after calling one was installed. The elevator worked fine but is terribly slow and inconvenient. The furniture in level two is very dirty and stained. We would not even sit in it. Having said this.. SSI is a wonderful place and we have vacationed there for the last 12 years so we a great visit...just sub par accommodations for one of the best vacation spots in the south. Loved the view, location, access to the beach, and living space. The only comments I have are the house is in desperate need of safe and comfortable deck furniture. What they have now is either broken, rickety, uncomfortable, and inadequate. Their deck is really the best feature of the house and without good furniture, it is almost a waste of beautiful living space.